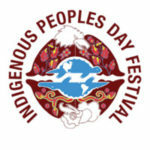 All My Relations Gallery (AMRA), and Native American Community Development Institute (NACDI) is hosting an Indigenous Peoples Day Festival to raise awareness, and provide education of Native American Arts. Free event. A film about how and why Indigenous people are standing up against a violent extraction-culture. 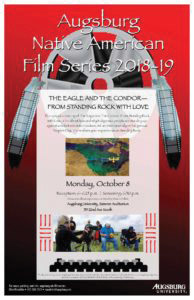 Come to share your experiences at Standing Rock! Reception starts at 6pm and screening at 6:30pm. Sateren Auditorium 715 22nd Ave So. 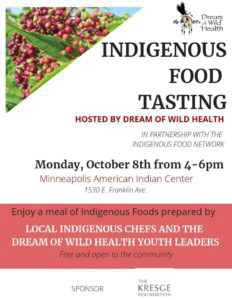 Our featured chefs are Brian Yazzie of Yazzie The Chef, Gatherings Cafe, Howasta Means, Christina White of Native Food Perspectives, The Sioux Chef team, and the DWH Youth Leaders!